When attending a large corporate event or even your favorite concert, the expectation is that the sound will be perfect and that the visuals will be extraordinary. Audio and visual perfection has become standard at large events, but few give any thought to who puts the work in behind the scenes to make sure that the occasion goes off with no problems. Take for instance, Super Bowl LIVE, the ten-day long fan festival that took over six blocks in downtown Minneapolis leading up to Super Bowl LII on February 4. The festival included daily live music from artists such as Idina Menzel, Rae Sremmurd and X Ambassadors as well as local favorites. The company that delivered the audio to everyone’s ears was Majic Productions, a sound, video and lighting production company based out of Waukesha, Wisconsin. Majic Productions was founded by University of Wisconsin-Madison alum Mike Jurken, who serves as president of the company. Meanwhile, his wife, Monica Jurken, an SJMC alum, serves as the vice president. The duo met through WASB, the Wisconsin Alumni Student Board, and graduated from the university in 2010. When he was twelve-years-old, Mike started a company called DJ Majic, where he brought a boom box to weddings and church events to provide entertainment. Throughout college, he continued to work small events and corporate affairs for his company. After graduating, Mike and Monica really started focusing on their current business, Majic Productions, building and growing the company. After graduation, the Jurkens began the process of developing Majic Productions, and a primary focus was placed on branding the company to distinguish it as a professional, creative and passionate business. When many individuals picture audio-visual companies, the thought of roadies out on tour who haven’t shaved in years comes to mind. This became a primary reason why the Jurkens placed an importance on building a strong, cohesive brand and Monica cites her time in the SJMC for instilling this value. Today, Majic Productions is properly branded and able to focus on what it does best, telling stories. While the company may be hired to run the audio for a concert or stage lighting at a political event, what it really comes down to is telling their clients’ story. “Yes, you might be running audio or lighting or video at a corporate event, but you’re telling that companies’ story to all of its listeners, all of its attendees,” said Monica. “It’s just really important for us to look at it that way. 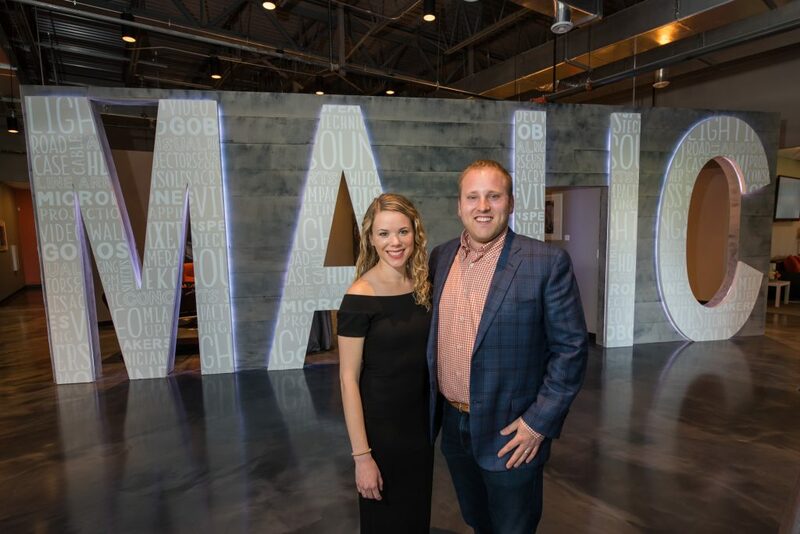 From their audio work at Super Bowl LIVE to their most recent work at the Kohl Center creating an audio-visual show during the pregame of the Badger Men’s Basketball home games, Majic Productions is busy telling stories for their wide-ranging clients. Nonetheless, Monica and Mike would not have it any other way.